The Hot Belly Diet is a program based on an Ayurvedic Diet to support healthy digestion. The book’s author, Dr. Suhas G. Kshirsagar, is internationally recognized in the ancient science of Ayurveda, which emphasizes a holistic approach to health. Kshirsagar claims that most people can lose 8-10 pounds within 30 days on this plan. 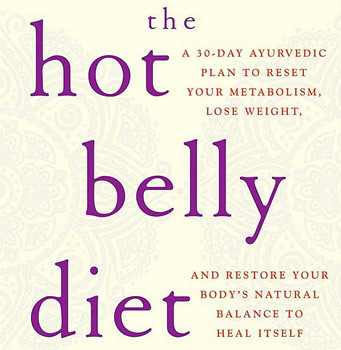 The Hot Belly Diet is based on Ayurvedic concept of “digestive fire” – also referred to as Agni. In Ayurveda a healthy digestive system is seen as the cornerstone of good health and optimal metabolism. Strong agni is also responsible for the absorption of nutrients and elimination of waste products. When agni is weak toxic residues build up and get trapped in the body, which can lead to health problems. The foundation of the program is a three-phase eating plan designed to naturally enhance your digestive fire. In the first three days you will detox your body, eliminate cravings and rev your metabolic engine. This phase begins to activate your digestive power for optimal digestion. Sugar, meat, processed carbs, artificial sweeteners and full-fat dairy. For the bulk of the program you follow a specific protocol with a meal plan that is laid out day-by-day. The goal of this phase is to stimulate appetite and prepare your digestive system for efficient nutrient extraction. You will consume your largest meal in the middle of the day – when digestion is strongest. It is also important to avoid snacking so as to allow your hunger to build between meals. These practices will help you rebuild your agni for a healthy appetite and more efficient digestion. The last four days are used to teach you how to keep losing weight as you introduce certain foods back into the diet. A castor oil cleanse on the last day is optional for flushing the gastrointestinal tract, especially the gallbladder and liver. Mung beans, basmati rice, quinoa, oatmeal, sprouted bread, black beans, low-fat yogurt, eggs, chicken, fish, tofu, blueberries, raspberries, apples, mango, spinach, parsley, red cabbage, spaghetti squash, asparagus, potato, avocado, pumpkin seeds, almond butter, dark chocolate, green tea. It is recommended to walk for at least twenty minutes after each meal, ideally within minutes of your last bite. This stimulates the production of healthy biochemicals and digestive fire. Strenuous workout are discouraged in phase 1 and 2 while you are purging and resetting your body. By phase 2 aim to incorporate yoga into your fitness regime two or three times a week. In phase 3 and beyond you can begin to incorporate heavy weight training or high intensity cardio. The Hot Belly Diet: A 30-Day Ayurvedic Plan to Reset Your Metabolism, Lose Weight, and Restore Your Body’s Natural Balance to Heal Itself retails at $26. Focuses on consuming a variety of fresh, organic, and unprocessed foods. Can help to improve digestive function and general health. Offers a gentle method for cleansing and detoxification. Necessary to prepare your own meals for the duration of the 30-day program. The castor oil cleanse may result in nausea and other digestive discomfort. Does not allow dieters much flexibility in terms of meal timing and food choices. Improving digestive fire is a traditional Ayurvedic method for enhancing general health and eliminating toxins from the body. The Hot Belly Diet may be a good option for dieters who have not responded well to raw diets or juice fasting. It will appeal to those looking for a gentle detox diet that includes a structured daily meal plan. Enhancing digestive function can also restore metabolism and promote general wellbeing, which supports natural and effortless weight loss. I have a medical diet plan that I’d like to make compatible with the Ayervadic method and would like to help.